How do you celebrate the 4th of July? 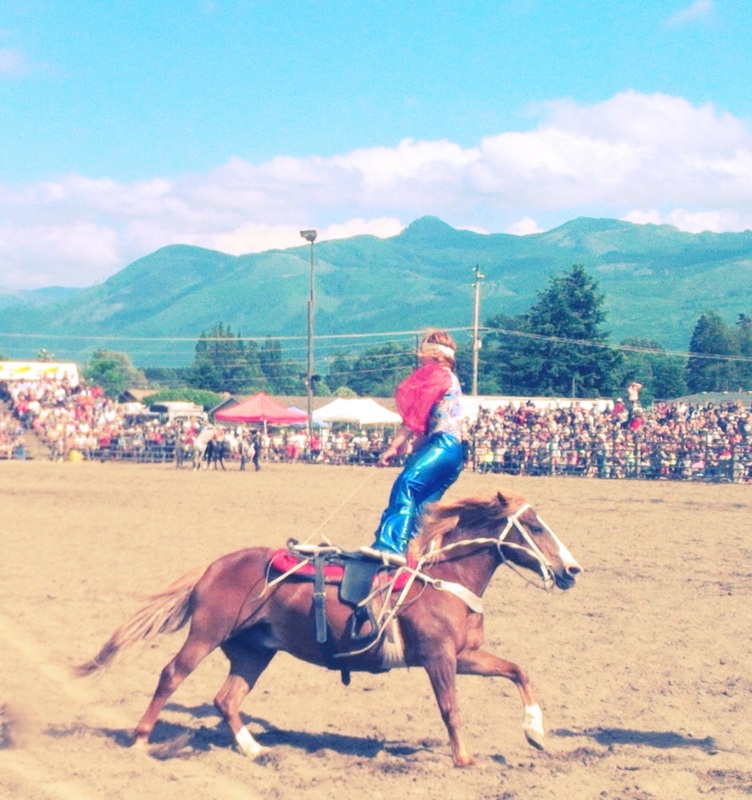 Here in the Pac-west, you can celebrate (as we did) by watching a logging competition, a chainsaw carving event, and a rodeo at the Sedro-Woolley Annual Loggerodeo. 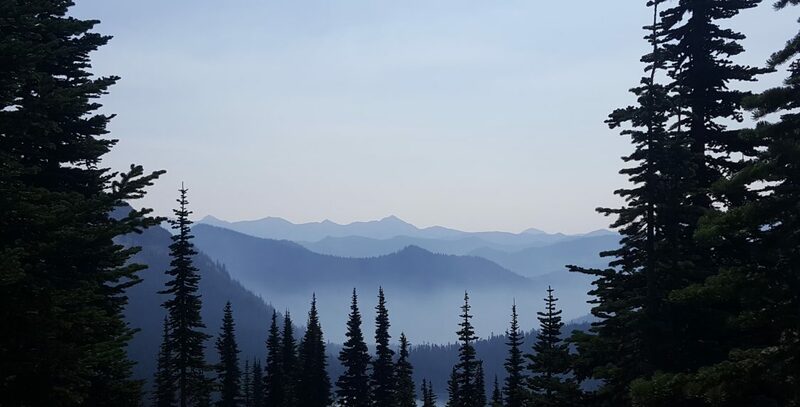 The event is said to be the longest-running 4th of July celebration in Washington State. 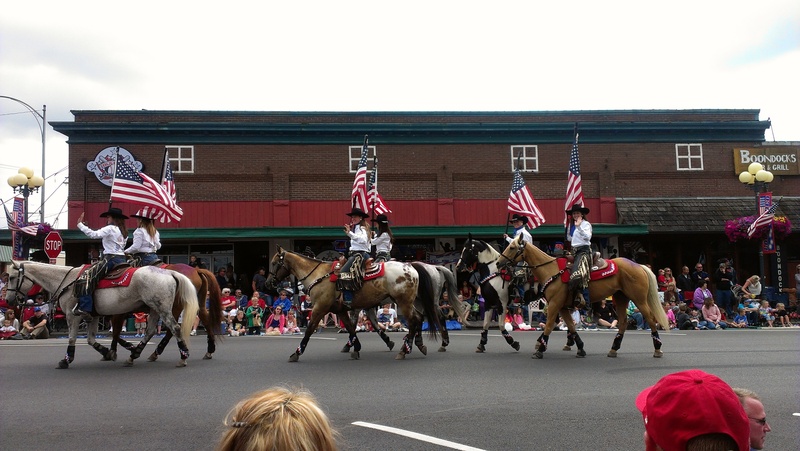 With a reported 10,000 visitors at the 4th of July celebration each year, Sedro-Woolley does not disappoint! The “Loggerodeo” (we learned) is a rodeo for loggers to demonstrate each task a logger is required to perform in their work each day, including chainsaw drills, throwing axes at targets (well they might not do this in a normal work day), and pole climbing. Not something we would see in Chicagoland! The day started (as any self-respecting 4th of July celebration would start) with a pancake breakfast at the SW Senior Center. We were driving from Seattle that morning, so sadly we missed the breakfast. But we arrived in time to watch the 39th annual “Great Sedro-Woolley Footrace,” a 5.17-mile race whose course primarily runs along the Skagit River before ending in downtown SW. Many contestants turned out for the footrace and they were cheered on by hundreds more. Down the street was the International Invitation-Only Chainsaw Carving Competition. Each contestant is armed with a chainsaw, axe and a few tools, with the challenge of whittling an 8 foot high, 3 foot wide piece of Cedar into amazing works of art. Carvings from past Loggerodeos line the main street of SW and are incredible! This year marked the 79th anniversary of the Loggerodeo Grand Parade. It lasted for two hours and consisted of lots of horses (later participating in the rodeo), trucks with lots of timber, floats, bands, and much more. Lots of logs at the Loggerodeo! After the parade, we went over to watch Greg Bisbey’s Logging Exhibition, which showcases the loggerodeo events mentioned above. Greg Bisbey is a Sedro-Woolley native, has been competing in logging competitions since the 1970s. At age 58, he showed no signs of slowing down, shimmying up a wooden pole in record time. The Exhibition featured about five or six tough men and one very tough woman, Natalie, who won the axe throwing competition with ease. 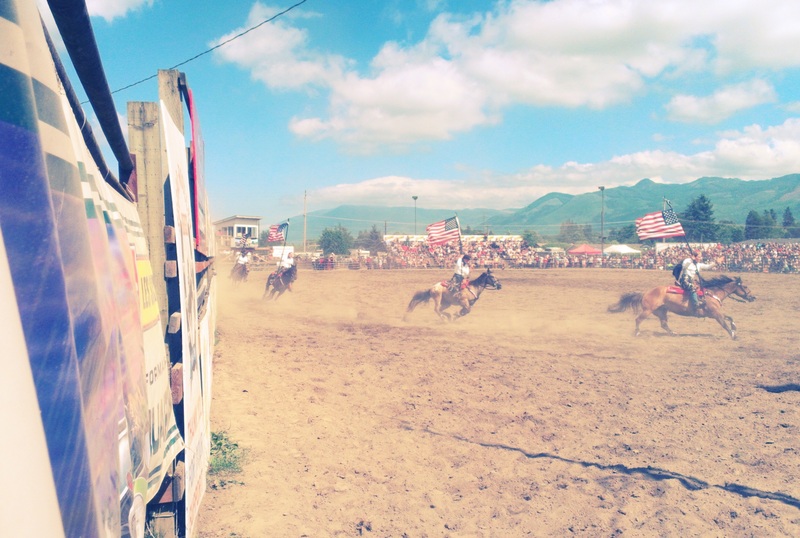 After the Logging Exhibition, we drove over to the Sedro-Woolley Riding Club Rodeo. While not on par with, say the Cheyenne, Wyoming rodeo, the SWRC Rodeo was truly an exciting experience! 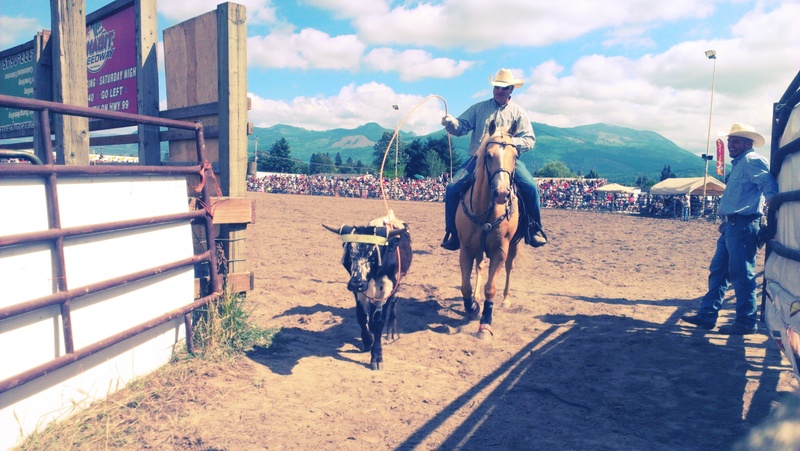 There were bucking broncos, steer roping (which I was glad to see was on the tame side – very animal friendly), and our favorite – the trick riders. This family of trick riders (mostly kids!) had no fear whatsoever as they stood up backwards (!!!) in their saddles, jumped up and over their saddles, and performed other amazing equestrian feats. This young girl is not only standing up, she is riding backwards! 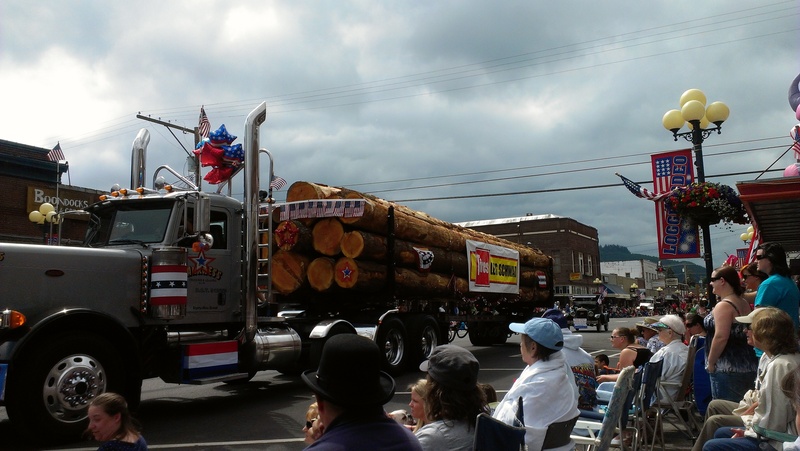 There are many other events during the week-long Loggerodeo celebration. We missed, for example, the SW Beard Festival which featured winners in twelve different beard contests (who knew there could be so many different contests specifically judging beards!). We also missed the Carnival and the fireworks. We chose, instead, to head back to Seattle to watch the Lake Union Fireworks, which almost didn’t occur this year due to low funds. Thankfully Amazon, Microsoft and Starbucks came to the rescue of their local fireworks and the show was amazing! 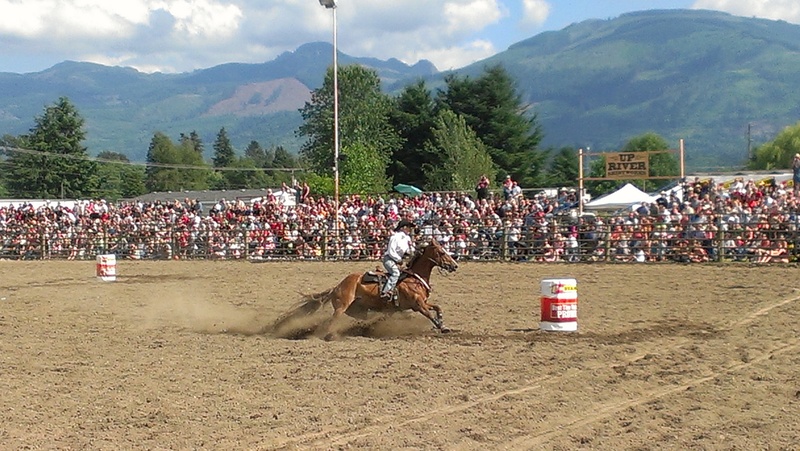 We look forward to returning to the Sedro-Woolley Loggerodeo in future years to catch more events. Chad may even start growing a beard!